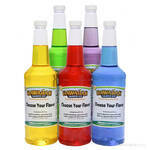 Enjoy that great soda fountain taste in the comfort of your own home with Hawaiian Shaved Ice cola flavored snow cone syrup. It tastes just like a cola, but it�s in a fun and tasty sno cone! Everyone loves a cold soda, and it will be even more delicious when you can bite into a snow cone and taste the carbonated flavor. 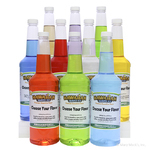 It�s a great alternative to buying a bunch of soda for your next party; kids will love the soda flavor! Grab this flavor in the gallon size today and the whole gang can start enjoying the delicious cola shaved ice syrup! This soda fountain favorite is sure to impress at your next party. 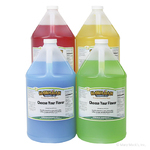 We have this flavor available in the quart size, for a smaller amount. 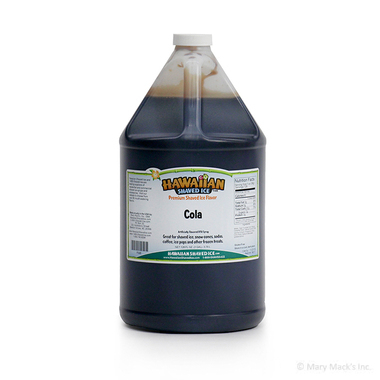 Cola flavored syrup is also available in the assorted package, so you can combine more great Hawaiian Shaved Ice flavors!